… Monday February 13th from 9:30 am till 2 pm. Every week since the beginning of the Sham Missing Women’s Inquiry, the Women’s Memorial March Committee has been rallying to denounce the disrespect and injustice happening inside. Dozens of DTES, Aboriginal, and Women’s organizations were shut out from participating in the Inquiry. Now we are hearing numerous stories, directly and as reported in the media, of family members outrage and anger and frustration with this inquiry as there are no answers, no apologies, and authorities are just protecting themselves and each other. We invite you all to join us – for five minutes or five hours – on Monday Feb 13th to show your disgust at this coverup sham inquiry and to call instead for for a new fair, just, and inclusive Inquiry that centres the voices and experiences and leadership of women, particularly Indigenous women, in the DTES. This year, the Feb 14th Women’s Memorial March occurs in the context of the Sham provincial missing women’s inquiry headed by Wally Oppall, which we are boycotting because we have been shut out from it and it has continued to marginalize the voices and experiences of women from the DTES. Women continue to go missing or be murdered with no action from any level of government to address these tragedies or the systemic nature of gendered violence, poverty, racism, or colonialism. The Feb 14th Women’s Memorial March Committee and DTES Women’s Centre have recently made submissions under Article 8 of the Optional Protocol of the UN Committee on the Elimination of Discrimination Against Women, and are now seeking justice internationally. 1) Spread the word and join us (all genders welcome) to the Feb 14th march. We respectfully ask that you please do not bring your banners, flags, or leaflets as the Women’s Memorial March carries five banners only to honour the women. 2) Plan a memorial march in your community. Last year, memorial marches were held in approximately ten other cities and communities. If you are organizing a memorial march please email us the details at marlene.george@vancouver.ca and hwalia8@gmail.com so we can maintain communication, compile the information on our website, and build strength in our coordinated efforts. 3) Please donate. 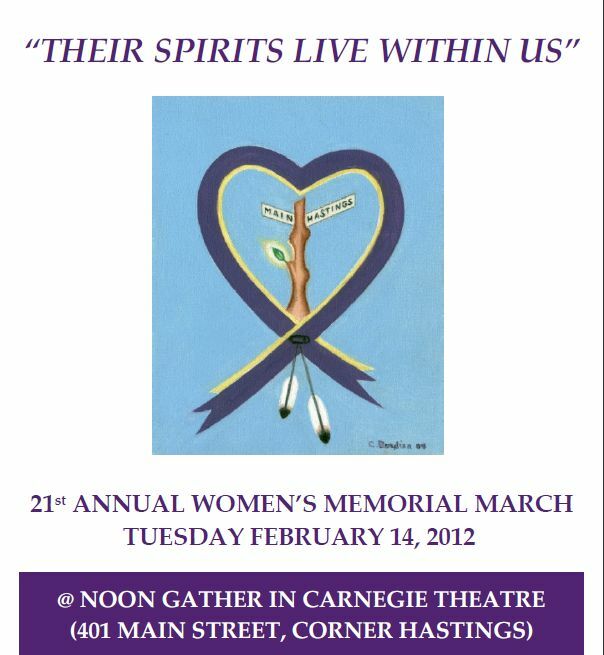 The February 14th Women’s Memorial March is made possible by organizations and individuals like you. Each year the Memorial March committee must raise funds to pay for such things as hall rental, sound system, food, red & yellow roses, memorial brochures, blankets, posters, candles, tobacco and other expenses. Please make cheques payable to the Downtown Eastside Women’s Centre, and include Feb 14th Women’s Memorial March on the memo line. Mail cheques to the Downtown Eastside Women’s Centre, 302 Columbia St. Vancouver, BC V6A 4J1. All donations over $10 will be gratefully acknowledged with a tax deductible receipt.